I loved it, couldn't put it down. 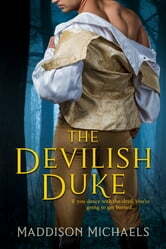 Absolutely captivating and witty, The Devilish Duke by Maddison Michaels was a great historical romance! I loved it, couldn’t put it down. She had me from the very first chapter, this book was engaging and entertaining. It had me laughing out loud, but it was also heartfelt and at times suspenseful. I think Maddison did an excellent job bringing these characters and their story to life. Lady Sophie Wolcott is hard not to love. She is very strong willed, independent, smart and beautiful, the full package. She finds herself in a predicament when she falls off of a tree while spying on the man she thinks she is in love with. 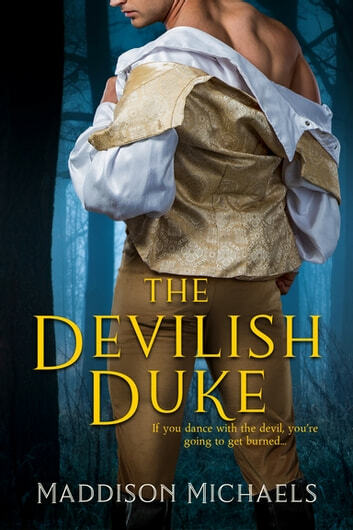 She literally falls at the feet of Duke Devlin Markham, the Devil Duke himself. Her first impression of Devlin was not a good one, he helps her after her fall but then they both go their own ways. She goes an entire year without seeing Devlin, but that didn’t stop her from thinking about him from time to time. Duke Devlin Markham had made quite a name for himself, but his reputation is another story. He isn’t called the Devil Duke for nothing. Not only does his title give him privileges, but it helps that the man is also extremely handsome and charming. He has all of the ladies chasing after him. All except Lady Sophie. He couldn’t figure out why Sophie had made an impression, and little did he know that she would turn his world upside down in the best possible way. When Devlins reputation gets in the way of a business deal, he is left without many options. He decides if settling down and getting married is what he needs to do to continue with his business deal, he will do just that. Having a hard time being able to forget the one encounter he had with Sophie, he decides she would be the perfect bride. Except Sophie wants absolutely nothing to do with him or marriage. Devlin and Sophie had the most undeniable chemistry, and their interactions were gold. They were most definitely meant to be. He pushed and she pushed right back. They quickly became one of my favorite couples. I was immersed in their story. The book had just the right amount of suspense, humor, and romance. I was impressed with the flow of the book. Everything just worked! Maddison gave us a flawless, well written story. I can not wait to see what else she has in store for us. Definitely worth all 5 stars! A marvelous debut novel for Maddison Michaels!!! Skillfully plotted and full of romance and a mystery to be solved, I really could not put this one down. Using the setting of the Victorian era, there is even a meeting with Queen Victoria and our hero, Devlin Markham, the (Devil) Duke of Huntington. When a story starts out and I find myself laughing out loud pretty quickly, I know I am in for a great read. Lady Sophie Wolcott is in love and she finds herself up in a tree spying on her beloved proposing to a lady and is devastated. What is funny is that she is at a party and as she tries to quietly climb down, she falls into the bushes and that is when she meets the Devil Duke. That meeting is very important to the story because it becomes the bases for them meeting again a year later. Sophie is a bluestocking whose main interest is in an orphanage she supports that her mother had started. Devoted to raising funds and helping every child possible she is a feisty, outspoken heroine who has decided she will never marry or fall in love after seeing her mother devastated by her philandering father. Devlin on the other hand feels the same but is pushed into marriage in order to fund his business venture and be shown as a reformed rake. Sophie is the only choice of wife that Devlin can even consider and Sophie will benefit with hugh funding for her orphanage. What could be more perfect? Two people not wanting to fall in love and both benefiting from the union. Well that is when the adventure and mystery begin. Murder, disappearing objects and a growing attachment between Sophie and Devlin had me entrenched in the story. This author made the characters come to life and the secondary characters were delightful. Prepare to be thoroughly mesmerized as you read this wonderful story of fate taking a hand in bringing two people together and their journey to happiness. I cannot wait for more stories from this author!! Strong characters, some gentle humour. Nicely laid out plot. Would read other books by this author.